The season is over for Mahomes, but this isn’t the end. It’s the beginning. Patrick Mahomes just missed out on going to the Super Bowl, but that doesn’t take away from the ridiculous season that he had. 23 years old. First season as a starter. The likely NFL MVP. That’s unheard of. What we just saw in the AFC Championship game wasn’t just the Chiefs vs. the Patriots or Patrick Mahomes vs. Tom Brady — it was a glimpse into the future of the league. Even with the Chiefs’ 37-31 overtime loss. Mahomes played well against the Patriots. He threw for 295 yards and three touchdowns, which would normally be enough to get the win. The Chiefs scored 24 points in the fourth quarter to help push the game into overtime. Mahomes threw two touchdowns in the fourth quarter, including a 1-yard pass to running back Damien Williams while he was rolling out toward the sideline — under pressure. A 1-yard pass doesn’t seem like much, but watching him execute the play on the biggest stage of his football career was incredible. Mahomes also hit two clutch, high-difficulty throws on the Chiefs’ last drive to tie the game. The first throw was to running back Spencer Ware along the sideline on an improvised play. The second throw was a 27-yard DIME to Demarcus Robinson that got the Chiefs the yards that they needed for the field goal attempt. Unfortunately for the Chiefs, they never got the ball back after tying the game at 31. Brady led the Patriots on a game-winning touchdown drive on the first possession of overtime. Mahomes obviously hasn’t built up a resume that can stand the test of time like Brady has, but if his 2018 season with 50 touchdowns and 12 interceptions is any indication, Mahomes is on his way toward being one of the elite talents to play the position. How does Mahomes’ 2018 season compare to other QBs? Mahomes finished the season with 9.6 adjusted yards per attempt, which ranks 10th all-time among qualifying passers. It wasn’t just the efficiency that made Mahomes’ season so special — it was the fact that he stayed efficient through such a high volume of attempts. Mahomes’ single season as a starter was so good that it favorably compares to Tom Brady’s single-season career highs in a multitude of stats. Here are the quarterbacks to reach at least 9 adjusted yards per attempt with at least 500 passing attempts since the 1970 merger. That’s it. 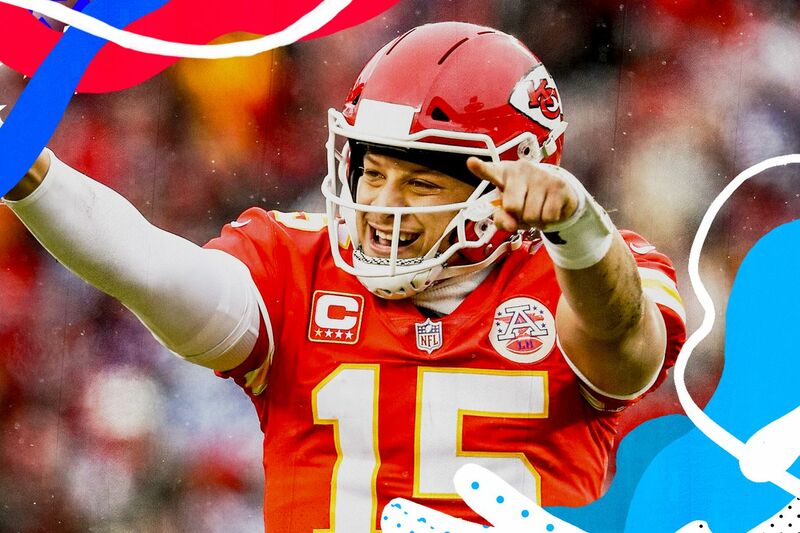 What Mahomes did this season was not only one of the best seasons in NFL history, but he did it in such a fun way. Just look at these throws — they all came on the same drive! Mahomes is also one of three quarterbacks to ever throw for 50 touchdowns in a season. Tom Brady did it first in 2007 and Peyton Manning achieved the same feat in 2013. Brady and Manning both lost the Super Bowl in those seasons. Brady recognizes Mahomes’ talent and made sure to seek him out after the game. While this loss is definitely going to sting, Mahomes and the Chiefs are poised for more playoff runs in the future. Based on the season he just put together, Mahomes is just getting started.